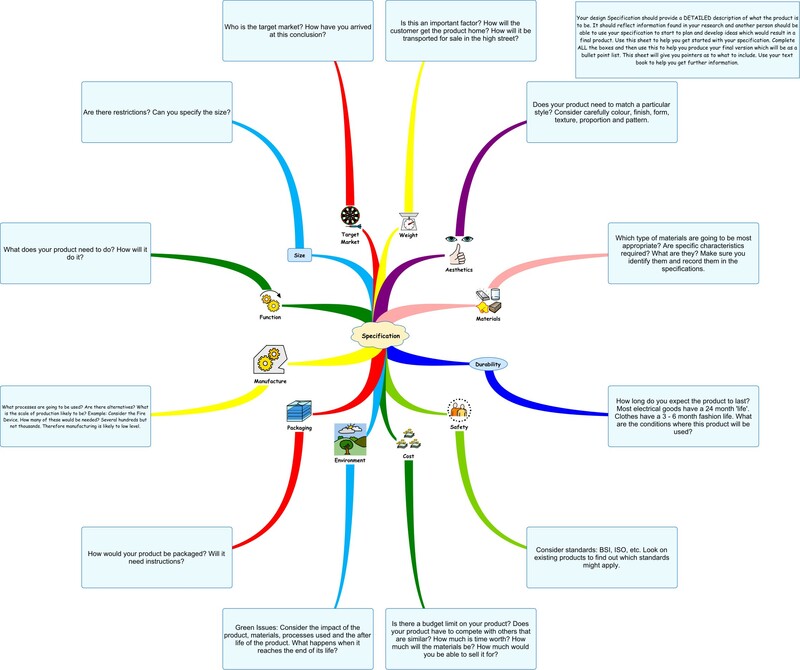 This is a mind map for the analysis of the problem, make sure that you have included this in your project folio. 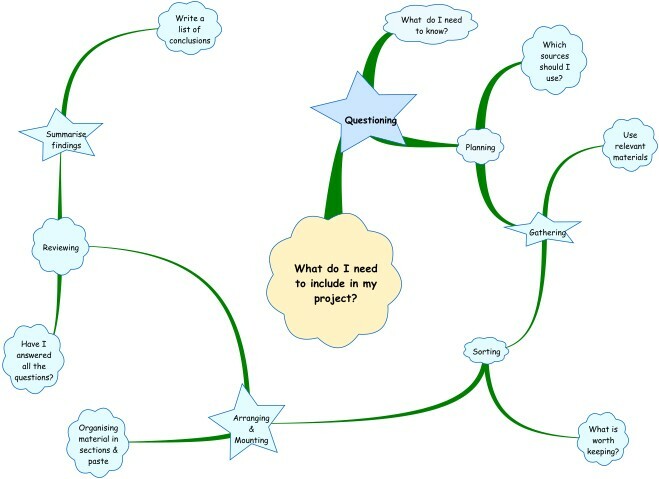 This map shows the areas of research that are commonly required for a project. Check that you have covered all the areas that are appropriate to your project. 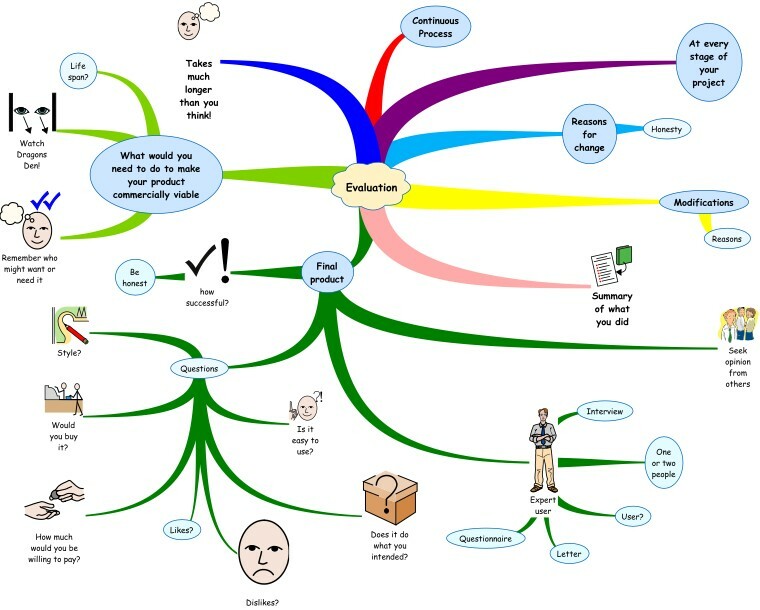 This mind map will help you plan your evaluation. The evaluation is one of the most important aspects of your project. Make sure that you leave enough time to get it completed (including the client evaluation). Description of the problem that you are trying to solve. This can and really should have pictures and diagrams of the situtaion/need. Research into the problem (what you found out and how you found out.) Do not include any publications from companies or product literature but make sure that it is in a separate folder and available when you hand your work in. The following are the most important pages in your project and need special attention! Specifications (with page numbers to reference them back to your initial problem analysis and research pages). Initial ideas and the evaluation of these ideas. Development of at least TWO ideas and more detail on at least one other plus evaluations of these ideas. Planning of the actual making process. Evaluation and photographic evidence of your practical work taking place. Include with you folder ANY other rough work, models, test pieces, development and working drawings that you have done in the correct sections of your folder. Industrial practices, systems and control that you have used or could have used. This includes jigs, templates and formers, CAD and references to CAM. Each page MUST be numbered clearly. If you are not sure then please ask.